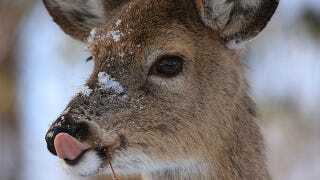 Deer aren’t the slim, graceful vegans we thought they were. Scientists using field cameras have caught deer preying on nestling song birds. And it’s not just deer. Herbivores the world over may be supplementing their diets. When researchers in North Dakota set up “nest cams” over the nests of song birds, they expected to see a lot of nestlings and eggs get taken by ground squirrels, foxes, and badgers. Squirrels hit thirteen nests, but other meat-eaters made a poor showing. Foxes and weasels only took one nest each. Know what fearsome animal out-did either of those two sleek, resourceful predators? These supposed herbivores placidly ate living nestlings right out of the nest. And if you’re thinking that it must be a mistake, that the deer were chewing their way through some vegetation and happened to get a mouthful of bird, think again. Up in Canada, a group of ornithologists were studying adult birds. In order to examine them closely, the researchers used “mist-nets.” These nets, usually draped between trees, are designed to trap birds or bats gently so they can be collected, studied, and released. When a herd of deer came by, they deer walked up to the struggling birds and ate them alive, right out of the nets. This behavior is not limited to one species or one continent. Last year, a farmer in India made a video of a cow eating a recently-hatched chick. Some scientists speculate that herbivores turn to meat when they’re not getting enough nutrients in their diet. It’s possible. A biologist in Scotland documented red deer eating seabird chicks, and concluded it was how they got the dietary boost necessary to grow their antlers. The same researcher also documented sheep eating the heads and legs off of seabird chicks. And then there’s another cow in India, which reportedly ate fifty chickens. There may be a specific need that drives herbivores to occasionally eat meat. It’s also possible, experts say, that eating meat, when it can’t run away from them, is just something supposed “herbivores” do, and we’re finally getting wise to it. The famous line from The Simpsons might be accurate - If a cow ever got the chance, he’d eat you and everyone you ever cared about.